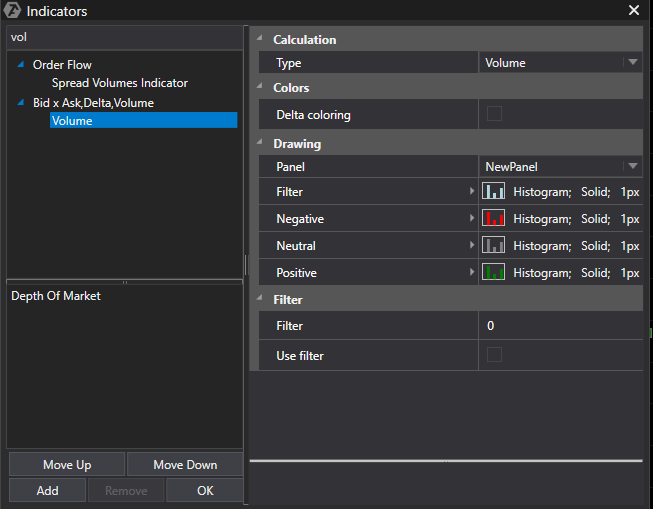 To add and setup the following indicator, open the Indicator Setup window. DeltaColored – when this mode is on, the bars of the indicator will be painted depending on the delta (the difference between the market sales and buys) of the given bar. When the delta is positive, the bars will be painted green, when the delta is negative – red. Colors can vary depending on the color settings of the indicator. If the following option is off, the bars of the volume indicator will be painted depending on the direction of the price bar. Panel - responsible for the place position in the chart. Negative – color setup of the histogram column, where the sales prevailed. Neutral – color of bars of the volume indicator of the neutral Doji price bars (opening price equals closing price) or for bars with zero delta, depending on the DeltaColored mode. Positive –color setup for the histogram column, where the buys prevailed. Show Legend –display names on the indicator panel.